OwnFone is a UK-based company that has taken the guesswork out of making phone calls. Their phones are designed with children and seniors in mind, to make the process of making phone calls simpler –something we could all benefit from really! In 2012, the company gained popularity when they introduced the first partially 3D printed cell phone. In 2013, they introduced the “1stFone” which was targeted at children. The 1stFone was designed to give parents the ability to customize their child’s phone –giving them the ability to call preprogramed numbers of importance. OwnFone is a lightweight, mini mobile phone that offers low cost calling and eliminates the extras that many don’t want. It gives you the custom option of adding up to 12 important names and numbers. Since it is the size of a credit card, OwnFone is small enough to go anywhere your standard cellphone would go. OwnFone has just introduced their next line of mobile phones this week. 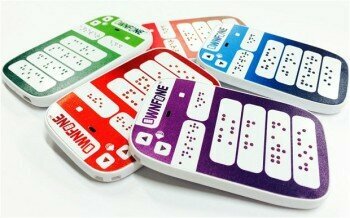 Their latest line is called “OwnFone Braille” and is designed for those who are visually impaired. It is the world’s first customizable Braille phone. The phone offers the same customizable options as their previous lines, with the ability to add certain numbers and specific colors. Once online, users can choose to add Braille to their phone and the online system automatically converts names and numbers into Braille. Tom Sunderland, the founder of OwnFone says he chose to use 3D printing since it keeps the cost down. Since Braille phones are relatively small compared with mainstream markets, it would have been too expensive to have developed these phones using traditional methods. “3D printing provides a fast and affordable way to overcome this barrier,” Sunderland said. While other Braille phones have been designed before, this is the first phone that has been made available for public purchase. The OwnFone is available in the UK for £60 –about $100, but the company has plans to launch a Kickstarter campaign to raise funding to make the phones available internationally.